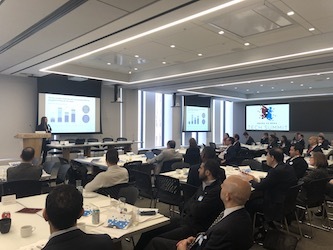 ABANA, Harvard Business School Alumni Angels (HBSAANY), HOF Capital, Tech Wadi, Harvard Arab Alumni Association (HAAA) and Middle East Venture Capital Association (MEVCA) held a very successful Tech Summit on March 20, 2019. The Summit focused on investors and startups with ties to the MENA Region, featuring conversations with VCs, entrepreneurs, legal and FinTech experts. On behalf of the Summit’s Organizing Committee and Abbas Zuaiter (Event Chair), we would like to thank everyone who was a part of making the 2019 ABANA US-MENA Tech Summit a great success! We provided our attendees with informed perspectives on investments whether it be in the MENA region or beyond, global entrepreneurship and what it takes to build a successful startup in MENA, changes in the region’s regulatory framework and a look at some of the new ways to finance FinTech companies. We were delighted to host a number of leading venture capitalists, entrepreneurs and fintech experts, including Noor Sweid, Founder & General, Global Ventures; Ramy Adeeb, General Partner, 1984 Ventures; Raed Al Masri, Partner, Transform VC; Namek Zu’bi, Founder & Managing Partner, Silicon Badia; Lucy Wang, Principal, 11.2 Capital; Abbas (“Eddy”) F. Zuaiter, Co-Founder & Managing Member, Zuaiter Capital Holdings; Pratin Vallabhaneni, Partner, White & Case; Rabih Nassar, Founder & CEO, Scriptr; Toni Azar, Director, FinTech Consortium; Mustapha Baassiri, Co-Founder & COO, Advizr; Karim Fattal, COO, HOF Capital. We also heard pitches from Ceek Women’s Health, Helena, Cheetay, Fitnescity, All Compliance Services (ACS) and Legacy. On behalf of ABANA, Harvard Business School Alumni Angels of New York, TechWadi, MEVCA and Harvard Arab Alumni Association, HOF Capital and White & Case. We hope that will be able to join us at the 2020 ABANA US-MENA Summit! To help us prepare an even better program next year, please take this 3-minute survey with your feedback and suggestions.